First - there was the day of tasting in Malibu with Marya, Shawn, Debra, Xochitl, and Barry at the Cornell Winery, one of our favorite places to hang and taste wines from the Malibu AVA. The highlight of the day for me was my friend Shawn's own wine, a deep, dark Syrah under the Shai label. He's been pouring at some small events, and for friends (thankfully!). He'll be releasing it soon. Watch for it! Second, there was last month's Grape of the Night at the Valencia Wine Company with Eve and friends discussing and tasting "organic" wines. Lots of discussion, lots of information, some confusion. Third, STARS of Paso Robles at the Peninsula - LearnAboutWine's usual high-end, very professional, crazy delicious evening of wines. I "won" a tasting for 8 at Kiamie in the silent auction, plus a couple of bottles of their delicious wine. 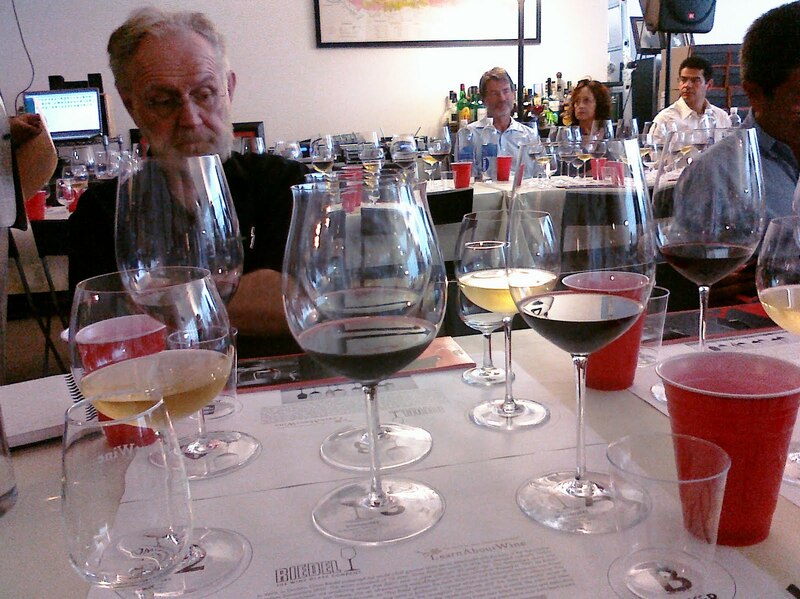 Fourth, George Riedel at LearnAboutWine's Loft218, demonstrating his amazing Sommelier series glasses. And Ian providing Joseph Phelps 2006 Insignia as the Bordeaux-style wine of choice. OMG. Fifth, Mark Newman and Dr. Joel Fisher and an evening of Tuscan wines at Mark's home. Lots of great wines, lots of laughs and great stories. And an amazing Spanish country food and wine pairing that left JD and me exhausted for days after! Sixth, JD and I went to Napa and Sonoma and Santa Maria/Lompoc/Solvang for a week of wedding, wines and dining. Seventh, August's Grape of the Night, where we all brought our favorite (except for Eve...) wines and talked about why we liked them. But wait! There's more! A lot more! You understand what I mean when I say I'm a bit overwhelmed. It's been an extraordinary summer. Great events, great wines, great people, and not a lot of time to write. Please stick with me! 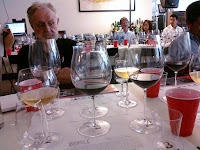 I'll have more news about great tastings and classes. Tease. You are one big tease. And a busy tease at that. Hi Goddess,keep up the extraordinary work! Doing my best, Eve. I'll have another post shortly in which I start to tell about the amazing week in Napa and Sonoma! Looking forward to our next GOTN!